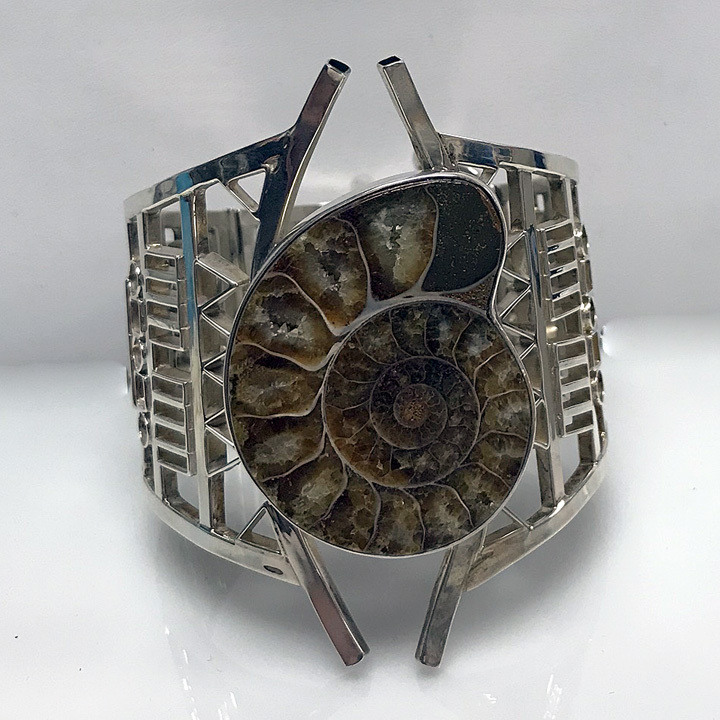 Cubist Jewelry - This is a handcrafted bold cubist sterling silver cuff bracelet that is made up of geometric shapes soldered together to feature a large Ammonoid Fossil, Ammonite. 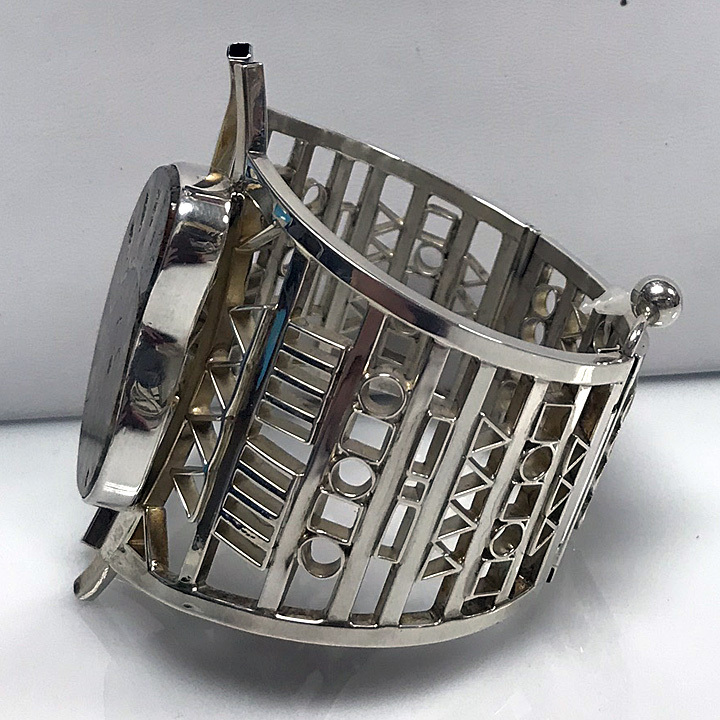 A pin closure allows the cuff to fit somewhat snug on the wrist. 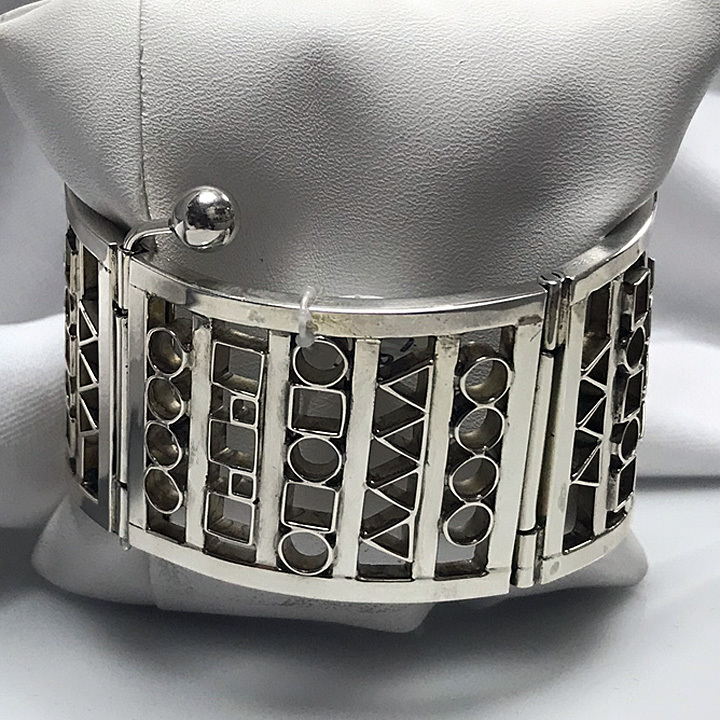 From our Cubism Collection, this is an exquisite handcrafted sterling silver bracelet that is bold and beautiful. 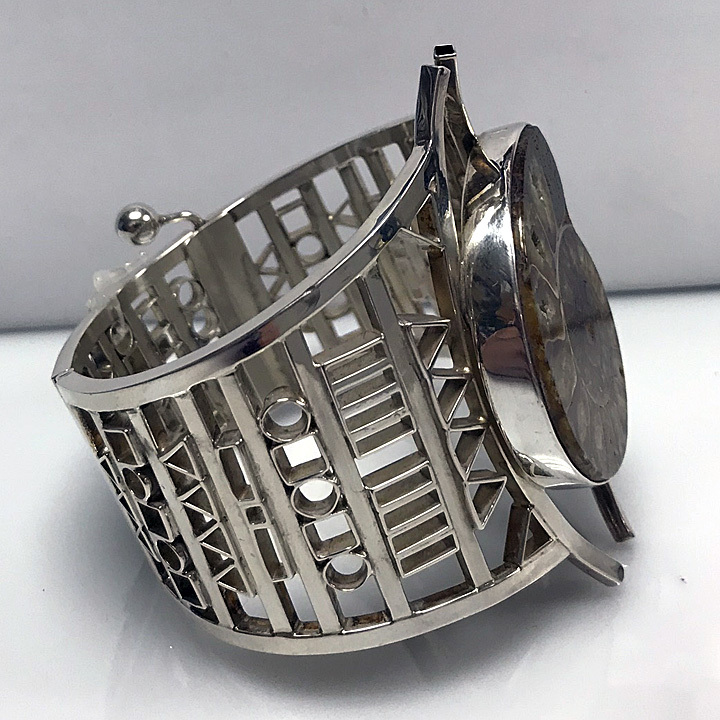 The cuff bracelet is constructed from sterling silver tubes of different sizes and shapes soldered together individually within a sterling silver frame. A pin closure allows the bracelet to fit somewhat snug on the wrist or arm to avoid the bracelet from turning. 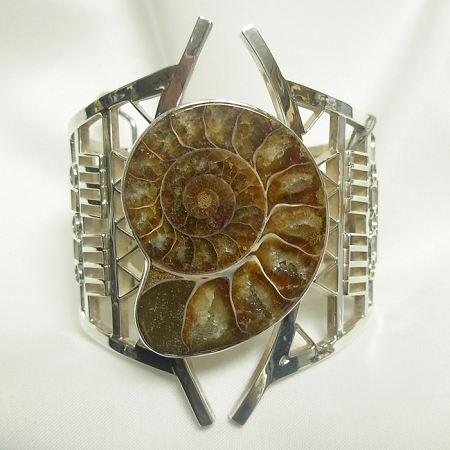 The statement cuff features a large Ammonoid Fossil, also known as Ammonite, that is fully bezeled in sterling silver. Every fossil is unique and will be approximately the same size as this picture. The Bracelet is approximately 3" wide in the front x 1.2" wide in the back. This Bracelet will fit up to a 7.5" wrist. 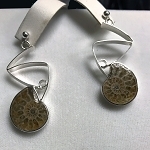 The Ammonoid Fossil is approximately 1.8" long x 1.5" wide (46.7mm x 38mm). 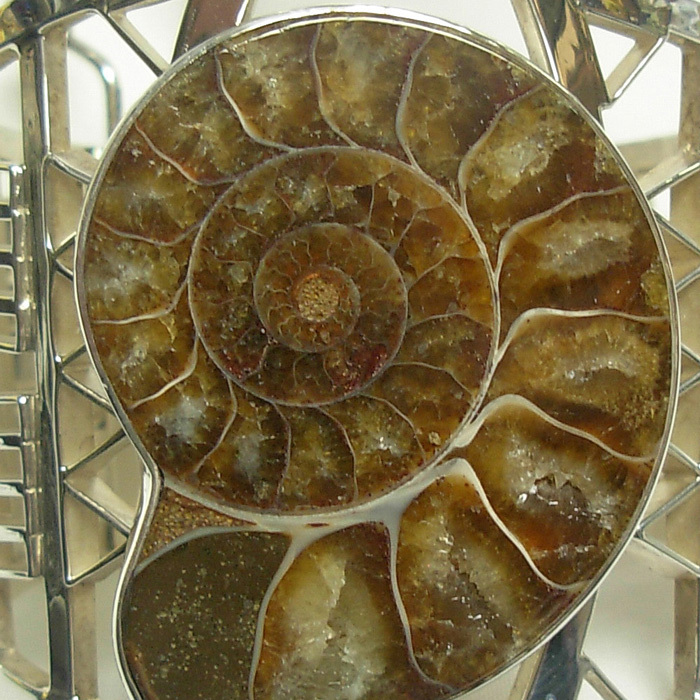 Ammonoids, also called ammonites, stimulate personal growth and help the wearer transition from the old to the new. Each purchase is shipped in a beautiful presentation box to impress your loved one. We also gift wrap. if you would like, and provide a handwritten card.